Now that you have your puppet on stage, you probably need to resize and reposition it to fit the scene. When you need to scale down or move a character, it's a good idea to hook (attach) the whole puppet to a trajectory. In Harmony, there is a type of layer you can add to your timeline, allowing you to create a motion path or reposition drawings. This trajectory layer is called a peg. 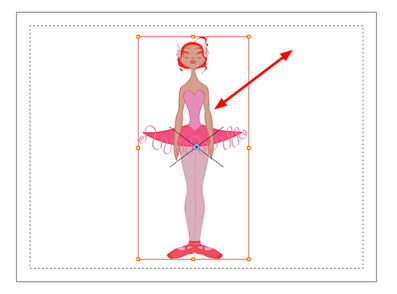 Any drawing or layer you hook to a peg will follow the defined motion path, rotation, scaling and skewing information. Attaching your puppet to a peg allows you to scale and reposition it without having to do the same on all the different parts and pieces. Only one layer will contain the position information, making your animation easier to modify and control. Next, position your character on the stage by moving it and scaling it to the correct size. You will not scale each layer individually. You can do it on the top symbol or top peg layer. In the Timeline view, select the top layer on which you want to parent a peg. NOTE: You must select a layer to be able to add a peg to your scene. Unless you use the Display All mode from the Display toolbar, an error message will display if you try to add a peg without any selection. In the Timeline view, click the Add Peg button. Double-click on the name of new peg layer and rename it: Master_Peg. In the Timeline view, select all the layers you want to attach to the new peg. Remember that one item is already parented to that peg. Drag the selection and drop it on the peg layer to parent all the character's pieces to the peg. If your layers are added above the already-parented layers, move that parented layer back on top of the layer stack. In the Timeline view, select the top peg layer (master peg). In the Tools toolbar, select the Transform tool and disable the Animate mode. In the Camera view, position the character.